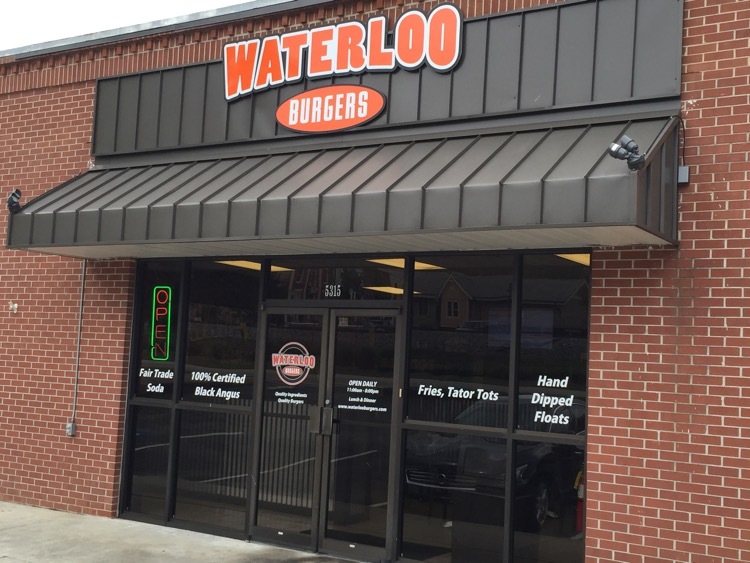 Owned by the same folks that have Moonie’s Texas Barbecue down the street, Waterloo Burgers opened in late January of this year. Someone with whom I travel quarterly was telling me about this place in May when we were visiting a common client and I had been wanting to give it a try, so two co-workers and I made the drive up to Flowery Branch for lunch today. There wasn’t anybody else eating in while we were there, but we did see a couple of folks picking up carry-out. Like many contemporary burger joints, they have a few pre-designed burgers and offer the ability to build your own, starting with the choice of proteins (beef, turkey, veggie, portobello or thick sliced bologna). Bologna? I could see the griddle in the kitchen and my decision was made. 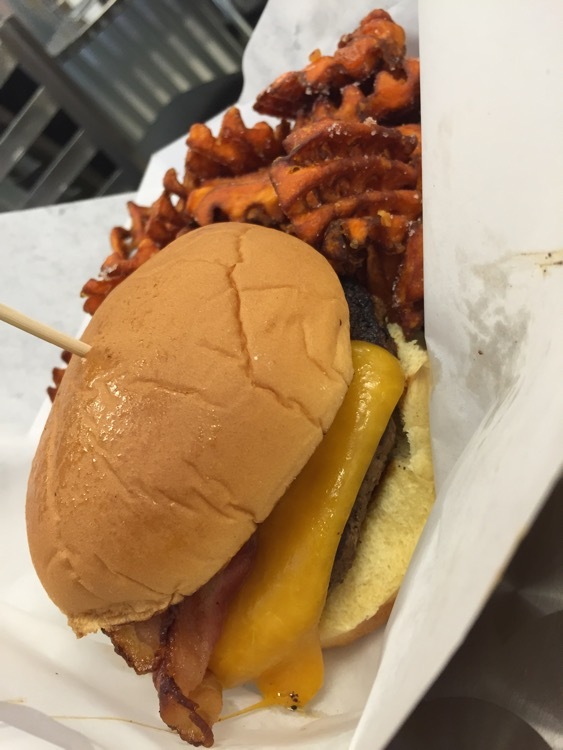 One of the guys had a beef bacon cheddar cheeseburger with sweet potato waffle fries. The burger looked excellent and the sweet potato fries were very good. I had never seen a place with sweet potato waffle fries, but they offered them with both powder sugar and cinnamon on them, so he accepted both and they needed no ketchup for dipping in. 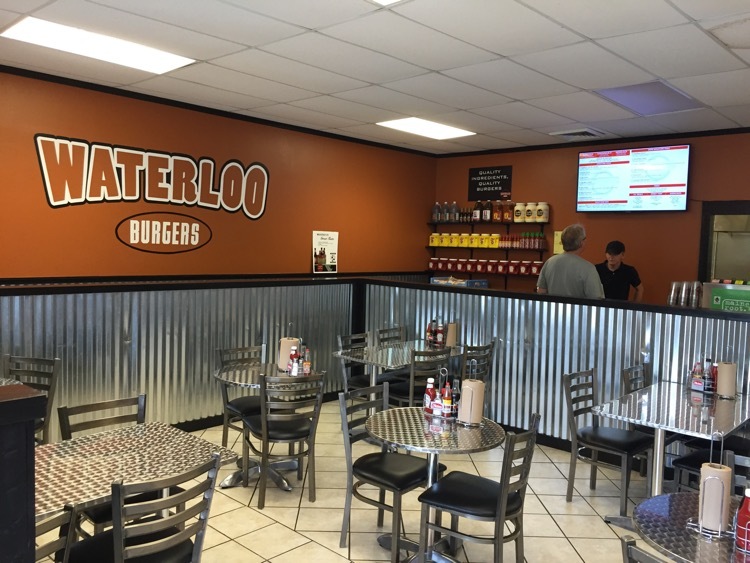 I believe that the menu that is on Waterloo’s FaceBook page is the old one, as I don’t see the one that I remember, which was about two weeks old, at the time. 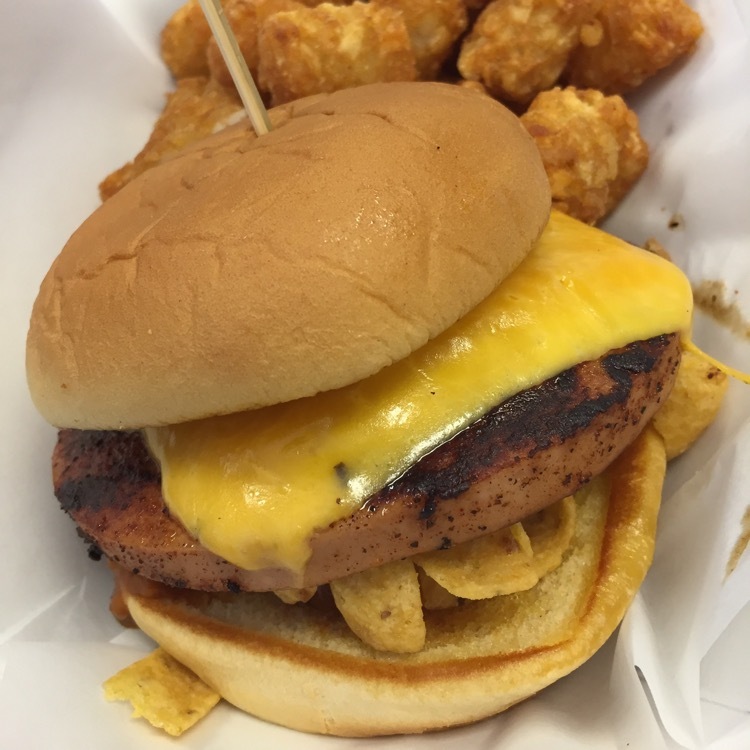 I ordered a pre-designed burger that contained cheddar cheese and Fritos, replacing the beef with the thick-sliced bologna, with tater tots. When the cook was bringing it to the table, he asked me to let him know how I enjoyed it, as no one had ordered that “burger” with bologna before. This was a really tasty sandwich. I’m a sucker for thick beef bologna and the only thing that could have made this sandwich better would have been having pimento cheese as an option (I mentioned that to the chef). They also served Maine Root sodas (looking at their web page, these appear to be marketed out of the Austin area) and I had a particularly tasty root beer (we later encountered these sodas at Pecan Lodge). I don’t know that Flowery Branch is ready to support $10+ burgers (particularly based on the comments on yelp, zomato and their facebook page), but I hope that it works out for them.